A prominent Florida eye doctor accused of political corruption was convicted of Medicare fraud Friday, increasing the odds that federal prosecutors could pressure him to testify against Democratic New Jersey Sen. Bob Menendez. Dr. Salomon Melgen faces 15 to 20 years in prison on 67 counts, including health care fraud, submitting false claims and falsifying records in patients' files, unless he offers or accepts a deal before his sentencing, scheduled for July 14. The senator denies any wrongdoing. The doctor, 62, collected more money from Medicare than any other physician in the nation — $21 million — at the height of the fraud in 2012. Following the announcement of his indictment, Sen. Menendez spoke to a crowd of his biggest supporters in New Jersey. Brian Thompson reports. He showed no reaction when the verdict was read and was immediately taken into custody. Several of his family members burst into tears outside the courtroom. "It's not fair," said his wife, Flor Melgen. "He's a good doctor." Defense attorney Kirk Ogrosky said he's considering an appeal. "He cares very deeply about his patients and tried very hard to help them," Ogrosky said. "He had hopes the jury would see it differently." Prosecutors had no immediate comment. The senator's defense attorney, Abbe Lowell, said he spoke with Menendez after the verdict, "and he is saddened for his long-time friend and is thinking of his family on this difficult day." "As we have known for the past two years, the issues involved in Dr. Melgen's case in South Florida had no bearing on the allegations made against the Senator, and this verdict will have no impact on him," Lowell's statement said. "Dr. Melgen's case focused solely on the day-to-day operations of his medical practice and the private care of his patients – specifics of which the Senator could not be aware, nor has it ever been suggested otherwise," the statement said. Melgen and Menendez face trial on Sept. 6 in New Jersey on charges the doctor bribed the senator for favors, including intervention in a billing dispute with Medicare. Prosecutors convinced jurors the doctor stole up to $105 million from the federal medical insurance program between 2008 and 2013 by performing unneeded tests and treatments on mostly elderly and disabled patients. Melgen's attorneys argued that the Dominican-born, Harvard-trained doctor was a kind and caring physician. They acknowledged that he made billing and treatment mistakes, exposing him to potential lawsuits and possibly losing his medical license. But they said they were unintentional, and therefore not a crime. Prosecutors countered that anybody can make an occasional mistake, but Melgen's actions were too numerous to be honest. For example, the doctor frequently billed Medicare for tests and treatment of prosthetic eyes. Prosecutors also pointed to tests run in seconds that were supposed to take five minutes or more. That made the tests unusable for diagnosis, but enabled him to bill Medicare up to several hundred dollars each for as many as 100 patients a day. He pocketed millions more by splitting single-use vials of an expensive eye drug into four doses and billing the government for each one, they said. He was soon hosting Democratic fundraisers at his 6,500-square-foot (605-square-meter) North Palm Beach home. 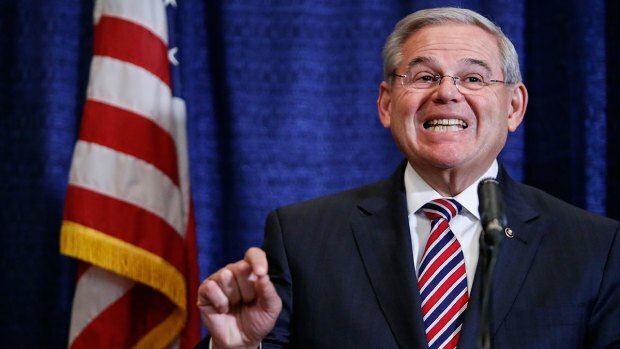 That led to his friendship with Menendez, during which Melgen paid for trips he and the senator took to France and to the doctor's home at a Dominican resort. Federal prosecutors say Melgen's gifts to Menendez were actually bribes. In return, they say, the senator obtained visas for the married Melgen's foreign mistresses, interceded with Medicare officials investigating his practice, and pressured the State Department to intervene in a business dispute he had with the Dominican government. "Dr. Melgen's case focused solely on the day-to-day operations of his medical practice and the private care of his patients - specifics of which the Senator could not be aware, nor has it ever been suggested otherwise," Lowell's statement said. "From the beginning, Senator Menendez has been clear that he has always acted in accordance with the law and in his appropriate legislative oversight role as a member of Congress. When all of the facts are heard, he is fully confident that a jury will agree and he will be vindicated."